The Porsche 968 simply means the legacy of the Porsche 944 gets to live on. In 1991 the 944 S2 was discontinue but the 968 was waiting in the wings to make its debut. Porsche has been busy working on a replacement model for sometime which originally was going to be called the 944 S3 but with so many new features they thought it was better to actually give it an entire new image. It hit the market retaining all of the great things of the 944 and added all the great new features. If you thought the 944 looked great the 968 is even more impressive with its sleek new lines while still clearly keeping its 944 image. It has fully integrated bumpers that are actually an extension of the Carrere 2, the air intakes have been rearranged, and it comes with pop up headlamps, red lenses neutral dense taillights, with the 968 lettering on the rear deck lid. The 16 valve DOHC inline 4 cylinder aluminum block has plenty to offer with an amazing 236 HP at 6200 RPM. It has a compression ration of 8.3:1 and 13.1 lbs per horsepower. You can choose from a 6 speed manual transmission or 4 speed tiptronic. The independent front has lower control arm, spring struts, and anti roll bar while the independent rear has semi trailing arms, anti roll bar, and transverse torsion bars. Fuel consumption isn’t really great but there are worse. It gets 17 MPG in the city and 25 MPG on the highway. Of course this is the type of car you want to get out on the road and let loose. You’ll get ¼ mile in 14.4 seconds with the 6 speed or 15.1 with the tiptronic transmission. You get 0-60 MPG in 5.9 seconds with the 6 speed or 7 seconds with the tiptronic. The 968 coupe has the best balance of any of the Porsche bodies and it has more power than the 944 with the 240 HP off the 3.0 liter engine. The increased HP is partially a result of the Variocam which is a camshaft chain drive that has an adjustable tensioner. The Porsche 968 was produced from 1992 to 1995 and it truly is a classic sports car in both the 2 door coupe and 2 door convertible versions. It was sold in Germany right up until 1995 and when production and sales ceased it really was the end of a Porsche era. The 968 engine was the second largest 4 cylinder engine that was ever put into a production car and it had the second highest output of power passed only by the Acura. The 968 borrowed the Brembo 4 piston brake caliper system and you’ll find it on all four wheels. You’ll also find a Macpherson strut front end, steel unibody structure, and aluminum front A arms. Now here’s something else to think about. How often do you get to put this kind of power on the street and stay legal? Well here’s your chance. The 968 CS is street legal but it truly belongs on the track. It’s been stripped out to lighten it up and it’s got plenty of power to impressive them all. Porsche is a company that’s smart! They keep the great components, have no trouble with innovative changes, and they have a way of putting it all together to provide a performance car that’s high in demand. 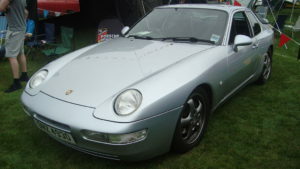 Part of the reason Classic Cars Online US exists is to help connect classic car buyers and sellers, and we’ve added several ways for you to connect, but first, be sure to visit the Classifieds page if you’re in the market to buy or sell classic cars such as the iconic Porsche 968.